The real victim in the Tuscon shootings, Sarah Palin used a paid appearance on Fox News on Martin Luther King Jr.’s day of remembrance to continue to paint herself as equal parts victim and American hero. I wish I could say that these Palin posts were getting easier to write as she stuffs more and more of her foot into her mouth, but alas that is not the case. Palin continued to pretend that the “mainstream media” – which she for some reason does not consider herself or her employer a part of, even though she is a paid correspondent on the 24 hour news media channel, Fox News – are solely blaming her for the deaths in Arizona. Which is simply not the case. Palin is being held accountable for her use of a graphic which put Rep. Gabrielle Giffords in literal crosshairs, and for using gun-centric rhetoric to cultivate her conservative fan base. Giffords, who we all now know what shot in the head, appeared on television beforehand warning that the graphic was dangerous, and that her office had been attacked and vandalized since the graphic appeared. The video is truly a must see if you haven’t already watched it. 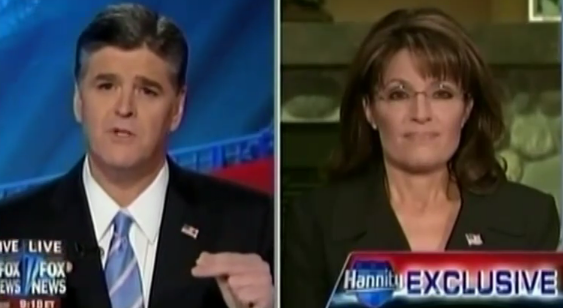 While speaking to host Sean Hannity on his Fox News program, Palin continued to deflect and blame others. On the use of the image, she offered up the excuse that it “wasn’t original” and that others did it too. And this is where I just lose my patience with her. Because these others, whoever they are, don’t tell their constituents to RELOAD their weapons! They don’t encourage, whether wittingly or not, their followers to vandalize and attack fellow politicians! And they certainly don’t try to spin their mistakes – which again, may have led in part to a Congresswoman being shot, and others killed – into victimized nonsense about the government and media trying to take away our rights. “They can’t make us sit down and shut up. And if they were ever to succeed in doing that, then our republic will be destroyed. Not necessarily me being sat down and shut up, but having the voice of respectful dissent being shut up, that would destroy our republic.”, says Palin. Ahhh. I see. Well, it’s nice to know that Palin is invincible to the very thing she is accusing the world of trying to do to her. This sort of self-invalidation makes it incredibly frustrating to take anything she says seriously. Also maddening is Palin’s inability to recognize that the majority of the country is exercising their respectful dissent for her via the very media she denounces as harassing her. No, YOU were the one harassing Rep. Giffords, she was shot in the head by a crazy person, and now we are expressing our respectful dissent of you. This is hardly complicated math here, and I sincerely hope that everyone listening to and watching Ms. Palin continues to see through her smokescreen. You can’t have it both ways, or all seven ways, or however many ways it takes for her to make herself out to be a victim and a champion of the people here. No, Ms. Palin. Just no. It’s a doozy, but her Fox News appearance is posted below.